Another day, another contest win for Cartel rider McRae Williams. This time it was victory at the Total Fight contest in Grandvalira, Andorra, sandwitched between the French and Spanish Pyrenees. The lineup was stacked with a world class lineup, not least Amplid’s very own Noah Albaladejo who styled his way to a fourth place finish. 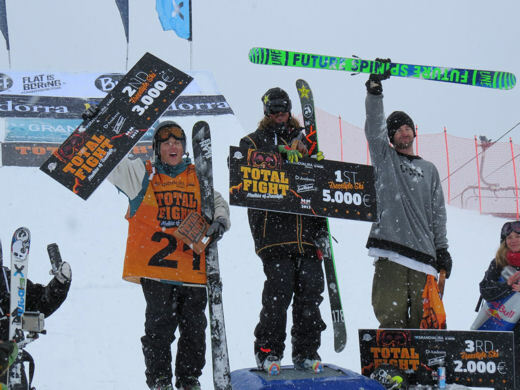 The contest day was overcast and snowy which made life difficult for the competitors but after his 3rd place finish at the Austrian Freeski Open and 1st at the European X Games slopestyle in Tignes, McRae is on a streak of world class form and once again proved unbeatable. Congratulations to both McRae and Noah for two incredible results!